Studio Jules Art - Blog: Happy News! This past week has been full of happy news. Last week I received an email that "Shattered Curves" was accepted into the Sacred Threads Quilt Show in Fairfax, VA. This is super exciting for me and I wish I could go to VA for the show. There are so many wonderful and talented art quilters who have pieces in the show. Several are SAQA members and I feel so blessed to be showing with them. 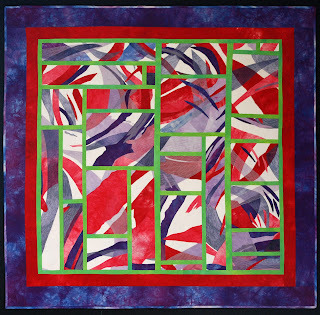 This quilt is also the promo quilt for an upcoming show the Dallas Area Fiber Artists are having in the Watson Gallery at Lovers Lane United Methodist Church, Dallas, TX. The show is in September to raise awareness for Alzheimer's. The Dallas Chapter of the Alzheimer's Association is also involved in planning this show. The title of the show is "Let's Make Alzheimer's a Distant Memory". All of the art work for this show will be made to the theme "The Mind's Eye". I know with all of the talented artists in the Dallas Area Fiber Artist and surrounding areas, it will be a fantastic show. Part of the proceeds from the show will go to support the Dallas Chapter of the Alzheimer's Association and the Art Foundation of Lovers Lane UMC. The next part of my happy news is Monday night was the closing reception for the Dallas Area Fiber Artists Annual Show. "The Truck Quilt" was awarded Best in Show! I am still pinching myself to see if it is true or if I'm dreaming. There were so many wonderful pieces in this show, I am so blessed to be associated with so many talented and generous people. Now, hopefully I will get some studio time tomorrow, along with embroidering labels for Baptism Quilts for church.